Hear all the updates from our year in review for 2018 and visit with several black-owned business vendors to prepare for your holiday shopping. 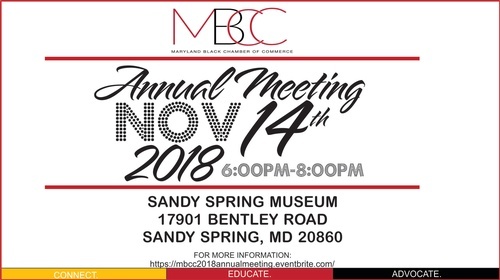 At this event, there will be networking, a brief presentation of MBCC updates and what to expect in the upcoming year, presentation of the Board of Directors, other speakers to be announced as confirmed. There are opportunities for vendors, Member Minute presentations and other sponsorship opportunities. Member tickets $15 and nonmember tickets $25. We will have vendor tables (4 available @ $200/each for members and $250 for non-members). We will also have spots for 2 Member Minutes @ $200/each. These are only available to members.